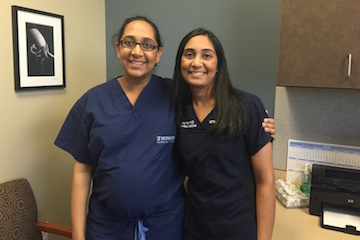 Dr. Shivani Patel poses with her sister, Dr. Toral Patel, a few weeks before Toral’s son, Elliott, was born. Congratulations! You’ve made it through the early pregnancy morning sickness and fatigue. Now it’s the third trimester and you’re so close to meeting baby. Unfortunately, there may be a few uncomfortable symptoms still in store for you. 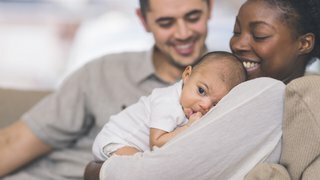 Swelling ankles, trouble sleeping, back pain, having to go to the bathroom every 20 minutes – these are all possibilities as you move into the pregnancy homestretch. Patients often ask me how to make the third trimester a little more comfortable. 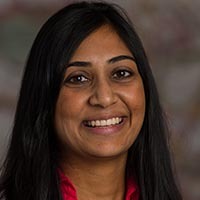 This topic has been on my mind more in the last few months as my sister, Toral Patel, who is a neurosurgeon at UT Southwestern Medical Center, entered her third trimester and began dealing with some of these discomforts. 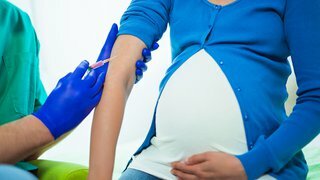 Let’s take a look at eight common symptoms during the third trimester of pregnancy: What causes them, how to help relieve them, and when you should call your doctor. Why it happens: When you hit 30 weeks of pregnancy, it may not just be your belly that’s swelling. You also may notice swelling (edema) in other parts of your body, especially in your lower extremities, such as your feet and ankles. During pregnancy, your body produces about 60 percent more blood volume. Meanwhile, your growing uterus is putting pressure on the large veins that return blood to your heart, leaving all the extra fluid to pool in your lower limbs. This pressure also may cause some veins to become swollen or look purple or blue. These are called varicose veins, and they should go back to normal after the birth of the baby. What you can do: The best thing you can do to avoid or reduce swelling is to reduce how long you’re on your feet. If you have to stand for a long period of time, take a break every couple hours to sit down and put your feet up for 10 minutes. This helps gravity pull fluids from the legs back into your circulatory system. One of the best times to put your feet up is after dinner. While you don’t have to have them straight up, get them as high as you can. I often tell patients to prop their feet up on a few pillows on the coffee table. I recommend doing this a few hours before bed because all those fluids that you’re helping return to the heart will be filtered by the kidneys and you’ll have to pee it all out. If you elevate your feet right before bed, you’ll likely have to get up right as you’re falling into a deep sleep to use the bathroom! When you need to be on your feet for a long time, wear compression stockings, or TED hose. These can go from your feet up to your knees or mid-calves. They help move fluids up to the heart and keep them from pooling in your legs. If you’re picturing your grandma’s stockings, don’t worry. Many manufacturers are making much more stylish versions these days. You wouldn’t even know some of them are compression stockings! If your shoes are starting to feel tight, wear shoes with straps you can loosen. Or if it’s nice out, throw on some flip flops. When to be concerned: If you notice sudden swelling, asymmetric swelling – such as one leg being larger than the other – or one calf being warm or tender to the touch, see your physician right away. These could be signs of a blood clot. Swelling in non-dependent parts of your body like hands and fingers may suggest the development of preeclampsia. Why it happens: Insomnia – trouble falling asleep or staying asleep – often occurs in the first and third trimesters, although for different reasons. In the first trimester, it’s a result of hormonal changes, specifically due to a surge of progesterone. However, your progesterone levels off in the second trimester, returning you to peaceful slumber. In your third trimester, sleep becomes more elusive because it’s difficult to get comfortable due to your growing belly. What you can do: Find the position that’s most comfortable for you to sleep in, whether it’s your left or right side. It doesn’t matter which side you pick. Sleeping on your back is likely not comfortable, but if you want to sleep this way, it helps to shift your hips just a little to keep all the weight from being on your back. There are a variety of body pillows you can try. My sister particularly liked the Snoogle pillow, which is C-shaped and goes up under the neck, around the shoulders, and between the legs. Practice good sleep hygiene, such as not watching TV or looking at your phone right before you go to sleep. Other things you can try before going to bed are sipping warm milk or tea, taking a warm bath, or using lavender scents in your bath or lotion. When to be concerned: If you’ve tried all of these things and you still can’t sleep, talk to your physician about which over-the-counter medications may be safe to take. Why it happens: You may find that you can’t eat as much as you used to or that you’re experiencing reflux. As your uterus gets bigger, it begins to push up on your stomach. This means there just isn’t as much space for food. Also, the sphincter between your stomach and esophagus doesn’t work as well during pregnancy. What you can do: Eat five small meals each day instead of three larger meals. Find foods that make you feel less full without lowering your caloric intake. For example, try a protein shake instead of a big sandwich. If you’re having problems with reflux, avoid foods that are spicy or acidic. Instead, choose foods that are creamy, such as yogurt. Don’t eat within two hours of going to bed to allow foods time to leave your stomach prior to going to bed. Elevating your head and not lying flat also helps to avoid reflux. When to be concerned: If you continue to have problems with reflux, talk to your doctor about an over-the-counter medication. If you are having reflux that is not related to something you ate, or you are experiencing heartburn or abdominal pain that doesn’t go away with medications such as Tums or Maalox, see your doctor. This could be an indication of a serious problem, such as preeclampsia. Why it happens: Restless leg syndrome is a sensation of needing to move your legs. This can manifest in many ways, from a general feeling of discomfort to a burning or throbbing sensation. My sister said it made her feel like she needed someone to pull on her legs. Restless leg syndrome is more common in the evening, making it impossible to fall asleep. While there are theories out there, we’re not 100 percent sure why restless leg syndrome affects so many pregnant women. What you can do: There’s no real cure for restless leg syndrome, but there are lifestyle changes you can make to relieve the symptoms, including staying hydrated. We recommend pregnant women drink 80 to 100 ounces of water each day. Calcium and vitamin D supplements also may help. Take a 20- to 30-minute walk around the time your legs are most restless to relieve the sensation. You also can try massaging the legs or using heat or ice packs. When to be concerned: If these tricks don’t relieve your symptoms and your sleep is affected, talk to your doctor about medication. Why it happens: Increased levels of progesterone during pregnancy relax the joints and muscles to accommodate the growing uterus and enhance flexibility in your pelvis so the baby can pass through the birth canal more easily. However, this also can cause pain. Your posture may change due to carrying extra weight around. You may find yourself leaning more to one side or another, which can lead to lower back or hip pain. What you can do: Wear a support belt under and over the belly to take some of the weight off the hips and back. There are a wide variety of types and brands to choose from. This won’t hurt your baby, so tighten it enough to get the support you need. When you sit down, place pillows under your hips or try sitting on a balance or yoga ball instead of a chair. Take a warm bath or use a heating pad on your hips or back to help relieve the pain. Remember, thanks to your growing belly, your center of gravity is much different these days. Skip the stilettos until after you give birth. When to be concerned: If you have unrelenting pain, a deep and sharp pain, or have become unable to walk or get up, see your doctor. Also, if you are experiencing a rhythmic pain in your low back every few minutes, it may be contractions, which sometimes present as low back pain. Why it happens: Sore breasts are common during pregnancy. Hormonal changes are preparing them to feed your baby, and you may find you go up a few cup sizes. Women with smaller breasts may find they have more pain than women with larger breasts. What you can do: I see too many women in their third trimester try to wear the same bras they did before pregnancy. Plan to buy new bras a couple times as your breasts grow throughout pregnancy – your breasts and back will thank you. When to be concerned: Sports bras may be comfortable during and right after pregnancy, but if they are too tight, they can inhibit milk production. We advise women who don’t want to breastfeed to wear a sports bra to help dry up their milk. If you plan to breastfeed, make sure your bra has good support, but don’t let it get too tight. Why it happens: Needing to run to the bathroom frequently may be the most annoying part of the third trimester. The volume of fluids running through your kidneys doubles during pregnancy, meaning you will need to pee twice as much. 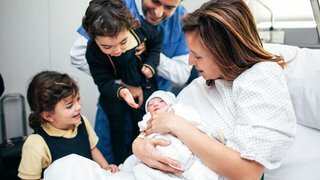 As your baby grows, he or she also may press on your bladder. What you can do: Unfortunately, there’s not much you can do about this. Don’t stop drinking liquids in order to avoid frequent urination. You need to stay hydrated. Dehydration can cause contractions, dizziness, and lightheadedness. Know you’re going to need to pee more often and prepare for it. For example, sit on the aisle or near the exit when at an event. When to be concerned: Sudden changes in urination may be cause for concern, such as if you’re peeing far more today than you were yesterday. Also, if you experience pain or burning when you urinate, or if there is blood in your urine, see your doctor right away. Why it happens: Along with swelling, fluid pooling in your legs instead of circulating throughout the body can cause dizziness or lightheadedness. You may notice this more when you have been standing for a prolonged period of time or when you get up too quickly. What you can do: Again, compression stockings can help by pushing blood out of the legs and to the heart. If you have to stand for a long time, keep moving to increase circulation – shuffle your feet or bend your knees by bringing your lower leg up toward your rear end a few times. Avoid getting up too quickly from sitting and lying positions. When you’re ready to get out of bed in the morning, sit up, put your feet on the floor, and wait a minute before you stand up and go. This will give your body time to adjust. This is another instance in which staying properly hydrated will help. When to be concerned: If you are constantly feeling lightheaded or dizzy, if it happens even after a short period of standing, or if it’s accompanied by a racing heartbeat, call your doctor. The upside to dealing with all of these issues? You are getting close to the end of the pregnancy! We understand these problems can make the third trimester feel like it will never end. However, a few simple changes can make it a little more comfortable. And remember, it’s worth it. Just ask my sister, who gave birth May 6, 2016, to a perfect little boy, Elliott. 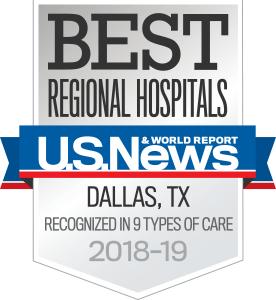 If you have questions about any third-trimester symptoms you are experiencing, request an appointment online or call 214-645-8300.